The Argos Catalogue and Call Centres, 2018. 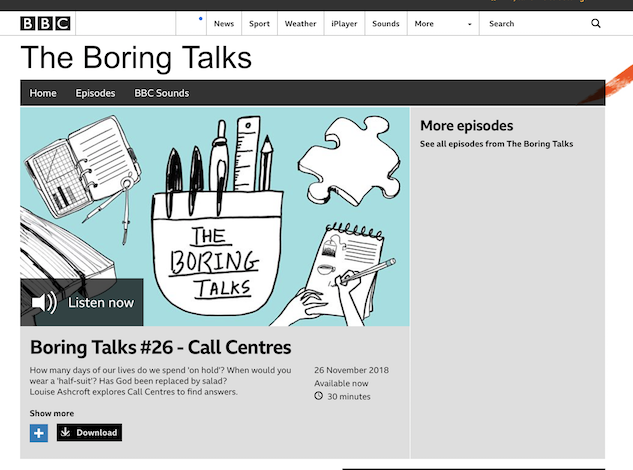 Two BBC commissioned audio work based on performance lectures I did at The Boring Conference in 2017 and 2018. 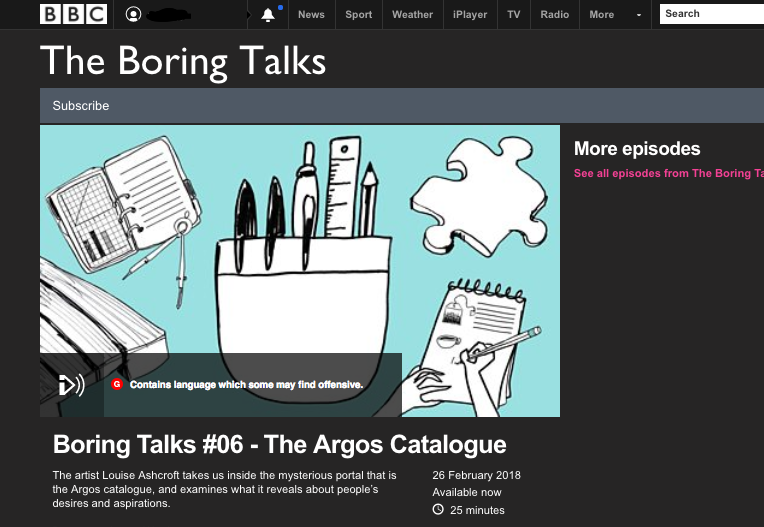 Click images to listen on iPlayer. Deptford Rainbows, video poem made for Deptford X Special Project commission 2018. Unicorns of Westfield, 2017. Made as part of I'd Rather Be Shopping, a mall residency and exhibition commissioned by Arebyte London. 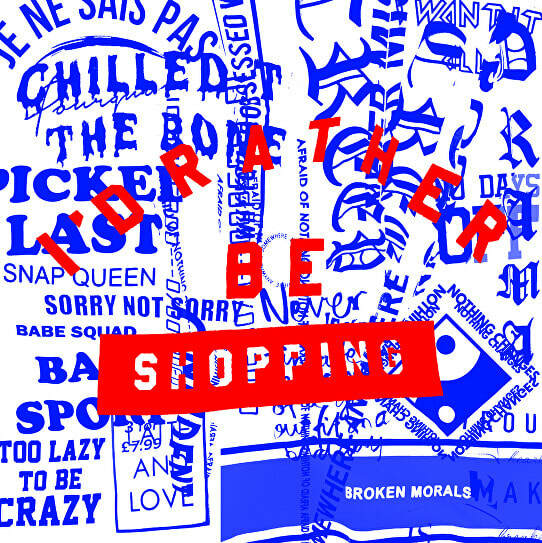 I'd Rather Be Shopping, 2017, is a grime track written by Louise Ashcroft and performed by the rapper Maxsta. The lyrics are a reconfiguration of text from the 2017 Argos shopping catalogue. Part of a residency and exhibition in Westfield mall in Stratford, the epicentre of grime music. Grime is a rap genre associated with revolutionary sounds, anger and sometimes directly political lyrics. To listen to the track on Soundcloud click the image below. Why Don't We Live Together, audio documentation, 2017. This audio piece is documentation of a bookable housework / life planning service. I visit strangers' homes and help them with domestic chores while we discuss how we might hypothetically spend the rest of our lives together. The meetings are a confidential space so the documentation mixes various narratives in order to preserve the anonymity of the individuals involved. No photographs were taken. I think you need to get out more, 2013. Advice for life improvised on a walk through Prague. Made for 'Addendum *On the Shortness of Life' curated by Anna Clifford and Miloslav Vorlicek at the Academy of Fine Arts, Prague (AVU). Pointing (monument) 2017 version. A day spent pointing at skyscrapers in Canary Wharf. Music by Cameron Dodds. It's Lovely Isn't It?, 2013. In collaboration with Noga Inbar. Exploring the transformative power of a multitude of masks, which they insert into real situations as catalysts for action and conversation. ​Break (dagger), 2013. I turned the TV on its back and placed a knife on it from the drawer of my self catering holiday apartment, while watching the adverts on a German satellite channel. Looping installation. Burrow, 2015. Sound piece with video object. Made to accompany an exhibition of photographs of William Burroughs at The Function Room in Somers Town. Drowning, 2016. Hybrid of 2 objects from the retail park. Waterfall, 2012. Part of a collaboration with Fritha Jenkins. Press Your Eyeballs Forcefully Against the Screen, 2014. Chronophobia (at The Function Room, Kings Cross). April 2014. How to Live in the Wild, 2013. Video made for a performance I did as part of a group show at Rushgrove House (a Georgian mansion in Woolwich) in November 2013. The performance involved walking and talking my way through a collection of video fragments, memories and notes from my peripatetic adventures through inner London, outer London and the countryside. Head-butting Burberry, and Other Mayfair Noises, 2013. Soundtrack and video shown as part of my performance at Rushgrove House, November 2013. Noises made on a walk through Mayfair, London. The colourful background is footage from me filming Saturday night TV close up to the screen. This video was used as a backing track over which I read a poem addressed to Britain's aristocratic land owners. Actions in London 2011. A series of actions, gestures and moments from my walks around London.